Yard signs tend to be great tools for advertising yard sales, party locations, and political affiliations. However, you can also create unique yard signs to celebrate special occasions, or add a positive vibe to your yard with quotes and friendly messages for passersby. Keep in mind that some neighborhoods have strict ordinances about yard signs, so before you spend the time and money on creating one, make sure your homeowner’s association isn’t going to send you nasty-grams for posting them. Now that you’ve received permission from your HOA to place yard signs, it’s time to consider which type you’d like. There are two main types: the H frame and the I frame. The H frame sign is a wire frame with two tines that slide into corrugated flutes on the back of the sign, and then a single or double crossbar lays horizontal between the two tines to add strength to the design. If you looked at it without the sign on the frame, it would look like an H. The other end of the tines goes into the ground until it feels sturdy. The I frame sign is basically an H frame without the crossbar on the back. These tend to be a little less stable, but also a little cheaper. Both tines have an end piece to prevent the sign itself from sliding down. As with the H frame sign, the ends of the tines go into the ground until the sign is sturdy. If you decide to go with an I frame, choose a sturdier material for your sign so that the wind doesn’t destroy it. After deciding which frame you’re most interested in, it’s time to design your sign. Sale signs are best with simple stock letters and contrasting colors. You can look at some simple designs of these types on our website at signworld.org. For signs that focus on special occasions or parties, you may want a more elegant design. Keep in mind that the goal of yard signs is to increase visibility, so despite their elegance, they need to be readable. If you’re directing a bridal party to your house and have a sign in the front that is white with silver writing, it’s most likely beautiful and elegant, but no one will see it. Choose contrasting colors and large letters, and for signs directing people to your house, you can attach balloons to the frame as an extra touch. If your goal is to create a yard of positivity with quotes, friendly messages, and uplifting thoughts, then you’ll want to create unique designs. Colorful graphics and bold type fonts will make these types of signs stand out. You can visit our gallery at Sign World and see if any of our previous designs catch your fancy, or you can create your own designs and we’ll put it on your sign for you. Either way, these particular signs are a project in fun, so your imagination is the limit on what you can do. Once you’ve created your sign, put it on your chosen frame and then pick its new home in your yard. The do-it-yourself craze has people scouring the internet for how-to’s on everything from cooking to car and house maintenance. In some cases, DIY is a great way to save money and it can be quite the learning experience. But, there are some things that it’s just better to have professionally done because it costs you more time and money than you realized at the start. 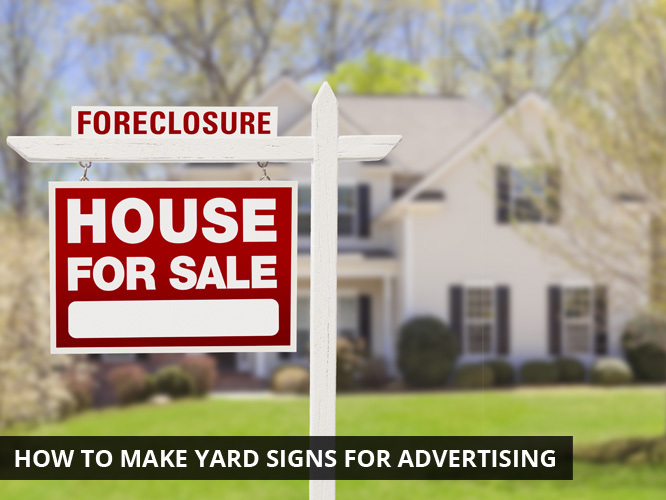 Yard signs aren’t exactly high dollar items that cost more in the long run, but there are still very good reasons to let us handle the job for you. Cutting cardboard evenly is hard work. We can easily place graphics on your sign. Graphics usually look better than handwritten or drawn work. Painting and drying a sign can lead to frustration if you make a mistake. If you’re the crafty type, the design and building piece may not be a big deal to you. But, consider the fact that a professionally made sign just looks cleaner and more professional than a handmade sign. Keep your target audience in mind when making the decision to do-it-yourself or to go with professionals like us. Yard signs are relatively cheap and easy ways to advertise or inject a little personality into your yard. There are so many options available, both in design and functionality, that the most challenging aspect for you will be deciding what you want. The best advice we can give when it comes to deciding on a yard sign is to consider the message you want to send.